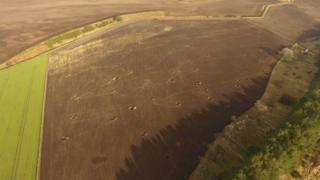 Archaeologists have carried out a dig at one of Scotland's biggest and most significant hunter-gatherer sites. Stone tools used by nomadic groups 7,000 years ago were first discovered in the field near Crathes in Deeside, Aberdeenshire, in the late 1970s. Since then evidence of human activity has been found going back 12,000 years to the end of the last ice age. The new investigation uncovered a trove of Mesolithic flints and also burnt wood and bark. Further analysis is now being done on the wood to better understand the significance of the find. From the amount of flints found during the dig, which involved excavating more than 100 test pits, archaeologists have calculated that the wider site could contain more than 500,000 of the stone tools. Students from the University of Aberdeen carried out the investigation, led by a team of archaeologists including Ali Cameron of Cameron Archaeology, Aberdeen University's Gordon Noble and stone tool specialist Ann Clarke, between 22-25 February. Soil scientists from the universities of St Andrews and Stirling also attended to look at the underlying sands and gravels with a view to mapping the evolution of the nearby River Dee and determining the most likely locations for habitation in the earliest periods of the site's history. Mesolithic specialist Caroline Wickham-Jones, who was also part of the archaeology team, said: "I thought it was a really positive exercise where we actually achieved our aims of sorting out the current state of the site. "Although it looks as if the surviving archaeology is confined to the ploughsoil, it remains one of the biggest and most significant hunter gatherer sites in Scotland."